BEIJING — China's ambition to soft-land a spacecraft on the far side of the moon later this year faces considerable challenges, but if successful would propel the country's space program to the forefront of one of the most important areas of lunar exploration, experts say. China hopes to be the first country to complete such a landing. On Monday, it launched a relay satellite to facilitate communication between controllers on Earth and the upcoming Chang'e 4 mission. The moon's far side is also known as the dark side because it faces away from Earth and remains comparatively unknown. Creating the ability to explore the far side of the Moon is an impressive achievement, John M. Logsdon of George Washington University's Space Policy Institute said in an email. "Spacefaring countries around the globe are focusing a great deal of attention on lunar exploration, and this far side capability, if it comes into being, will put China in a leading position with respect to that objective," Logsdon said. However, getting the relay satellite into the proper position will be tricky and marks only a first step in pulling off the landing, he said. "Doing things in space, especially at a far distance from Earth, remains hard, so success is far from assured, Logsdon said. A far side soft-landing would be a "world historical first," said Bernard Foing, head of the European Space Agency's International Lunar Exploration Working Group, which ?has collaborated with the Chinese program. That would offer a "deep science opportunity to study the far side," which has a different composition from sites on the near side, where previous missions have landed, Foing said. However, he too warned of the difficulties ahead, saying it would be a "great challenge using the relay orbiter for control and data." Such a communications relay link is needed for communication with a spacecraft on the far side because the moon's rocky bulk would otherwise block contact with Earth. China previously landed its Jade Rabbit rover on the moon and plans to land its Chang'e 5 probe there next year and have it return to Earth with samples — the first time that would be done since 1976. China conducted its first crewed space mission in 2003, making it only the third country after Russia and the U.S. to do so, and has put a pair of space stations into orbit. Upcoming missions include the launch of the 20-ton core module for the still orbiting Tiangong 2 station, along with specialized components for a more-than 60-ton station that is due to come online in 2022 and a Mars rover planned for the mid 2020s. Additionally, China has already obtained the "technological basis" to put astronauts on the moon, the chief designer of the manned space program, Zhou Jianping, told a conference last month. "We have had in-depth discussions with many experts about manned lunar exploration, and conducted research on key technologies in recent years," Zhou said. 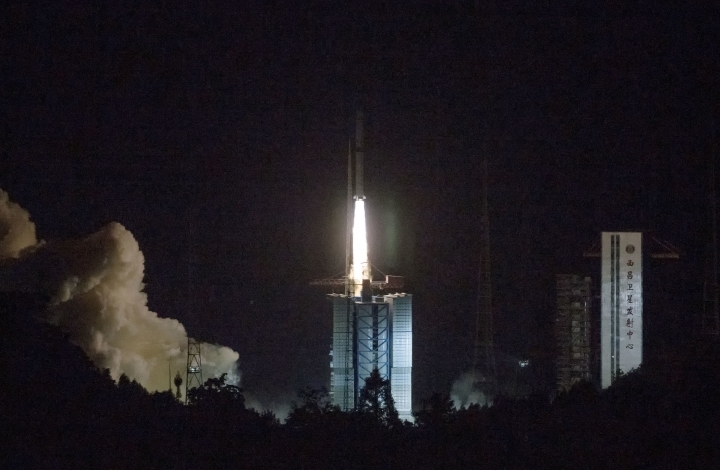 Although China's space program is largely military-run, the Chang'e 4 mission underscores how it is a developing "an ambitious civilian, science-based space effort alongside building up the country's national security space capabilities," Logsdon said. A number of Chinese commercial satellite launchers have also sprung up in recent years on the model, if not the scale, of private U.S. companies such as SpaceX and Blue Origin. Last week, Beijing-based OneSpace Technologies became the first private spaceflight company to send a rocket into space, launching its relatively small 9-meter (30-foot) OS-X for a test flight that ended with it falling back to Earth.